A former Harbury man who was involved in a shooting in a car near to Coventry’s War Memorial Park and ended up needing hospital treatment himself has been jailed for 17 years. Liam Timms and the man who accompanied him to hospital, Jason Cornwall, both stood trial at Warwick Crown Court after they denied possessing a firearm with intent to endanger life. 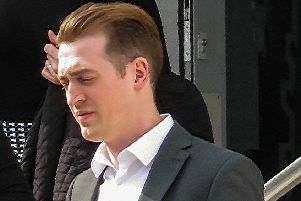 After just over two hours the jury found Timms, 23, of no fixed address, but previously of Leycester Close, Harbury, guilty by a unanimous verdict – but found Cornwall, 30, of Arundel Road, Coventry, not guilty. The jury had heard that in October last year a man called Ross White was seen staggering along Coat of Arms Bridge Road near the War Memorial Park in Coventry, crying for help after being shot in the right forearm and left thigh. A car said to be a Seat Leon was seen speeding away, and ten or so minutes later Timms, who had a shotgun wound to his left hand, went into A&E at Warwick Hospital, accompanied by Cornwall. But when Timms was told he would have to be transferred to University Hospital in Coventry, which is where Mr White had been taken, he walked out – before going to the Queen Elizabeth Hospital in Birmingham the next day using a false name. An attempt was later made to destroy the Seat by setting it alight in Wathen Road, Warwick. But it was not completely burned-out, and on the rear off-side door officers found Timms’s blood, while Mr White’s blood was found on the near-side rear door, and a partly-melted unfired shotgun cartridge was discovered in the front passenger footwell. Although the shotgun was never recovered, and neither Mr White nor the two defendants gave evidence, it was speculated that it had been fired inside the car, and therefore must have been a sawn-off weapon. Jailing Timms, Judge Lockhart told him: “The jury found you guilty of possessing a firearm with intent to endanger life. “You have not given evidence, and the man who was shot has not given evidence, but the facts that are plain are that you were in a car in Coat of Arms Bridge Road. “I can draw an inference that in that car with you was the shotgun, loaded and ready to use.